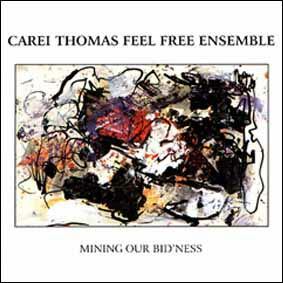 A revelatory debut album by a 64 year old pianist/composer may beg the question: where has Carei Thomas been all this time? Born in a culturally diverse neighborhood of Pittsburgh, Thomas cut his musical teeth in Chicago during a particularly fertile period for that city: gigging with Sun Ra as an improvising vocalist in 1959-60, joining up with the AACM for one hot minute in 1966, co-founding a group called The Light with Kalaparusha Maurice McIntyre (which also included Jerome Cooper and Wadada Leo Smith), and forming the compositional concepts that would provide a springboard for tireless exploration in the ensuing decades. Thomas moved to Minneapolis in 1972, where, in the mode of Horace Tapscott, he eschewed the industry-driven career path, choosing instead to work within the Twin Cities’ community. Recorded live with a group that features, most notably, the unfettered talents of Curlew saxophonist George Cartwright, Mining Our Bid’ness represents the range of Thomas’ no-boundaries Feel Free Ensemble, running the gamut from gorgeous Ellingtonian ballads to combustible free jazz testifying. Packaged in a mini-LP gatefold sleeve, with cover artwork by Judith Lindbloom, and liner notes by, among other contributors, Douglas Ewart and Anthony Cox. Until now, Thomas’ name has been known mostly to fellow musicians (David Murray, Sunny Murray and James Newton are counted among his admirers); this CD serves as the first opportunity for the general public to hear this important figure in the world of creative improvised music.